April 02, 2002 - The First Place Award goes to Joseph Cullen and four eighth grade students for their entry entitled: 'Watching Earth Change through the Migratory Sandhill Cranes' Journey.' 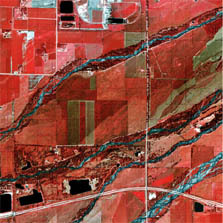 Students put together a team of scientists from USGS in North Dakota and Missouri and Rutgers University to acquire earth imagery, both aerial photography and Landsat Imagery. NASA will present the awards at a ceremony at the school later in the year.